Today is Spirit Day. Millions across the nation will wear purple as a sign of their of their love and support for LGBT youth and for their opposition to bullying. We join GLAAD, the main sponsoring organization, in spreading this message of inclusion and well-being. LGBT teens and young adults suffer greatly from bullying by peers in person and, increasingly, on the internet. Homo- and trans-phobic harassment against youth leads to vastly higher rates of substance abuse, self-harm, and suicide than the general population. Rejection from their faith community and religious-based discrimination only compound these problems. For Catholics, Spirit Day is also prime moment for reflection on our Church’s progress and where we are now headed in ministering to younger people with diverse sexual orientations and gender identities. Fear, hurt, and isolation persist for many LGBT Catholics who experienced decades of damaging language and actions. Pope Francis, though, has prompted a spirit of renewal that blows through our communities which demands that we act against anti-gay discrimination, especially when it targets youth. One bright initiative is called Anti-Bullying Learning and Teaching Resources (ALTER), sponsored by the Diocese of Wollongong, Australia. Responding to the rapid rise in bullying through cell phones and social media, the diocese’s Catholic Education Office produced a video (which you can view below) and a resource kit for adults in leadership. The Office provides an improved commentary on homosexuality that focuses on respecting people’s dignity and ending injustice. They recommend that educators use the word “gay” in their classroom discussions. This Spirit Day, Pope Francis’ handful of olive branches to the LGBT community has changed the tone by his comment “Who am I to judge?“, his America interview, or his handwritten note to gay Catholics in Italy. Leaders in the American hierarchy have been slow to follow his lead, but the Catholic laity continue to advance into greater inclusion. 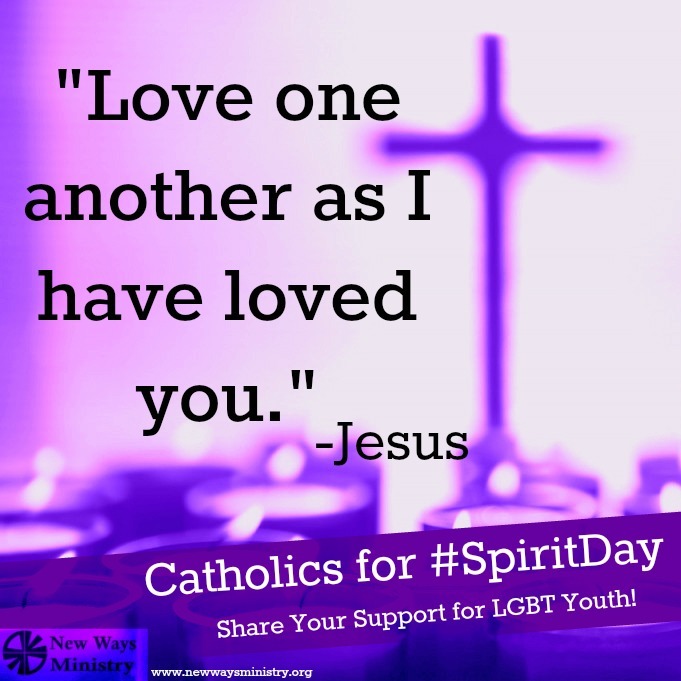 As Catholics, we at New Ways Ministry support Spirit Day, compelled by our faith to end bullying and sustain LGBT youth as they come to know themselves, their community, and God. We’ve changed our profile picture on Facebook to purple in honor of Spirit Day, and we invite you to do the same as a sign of support. If you use Twitter, consider using #SpiritDay in your tweets about support for LGBT youth today. Why not share the graphic above with your friends on Facebook? You can copy and paste it from this post or you can find it on the New Ways Ministry Facebook page.